The incident happened between Carntyne and High Street stations on Saturday afternoon. 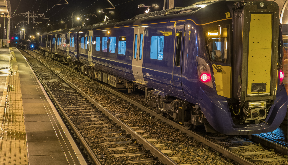 A person has been hit by a train near Glasgow. ScotRail is working closely with emergency services at the scene, but has warned that all services through Glasgow Queen Street low level will be disrupted until at least 5pm. Replacement bus services have been put in place between Glasgow and Airdrie, and to Cumbernauld and Falkirk. Passengers have been warned to expect delays, while anyone heading to Glasgow from the west of the city is asked to use services via Glasgow Central low level. ScotRail stated: "This incident has meant that our trains and our crews aren't in the correct position. "We're working to get them where they need to be, so we can reintroduce services in a controlled manner. This takes time, and we really appreciate your patience."